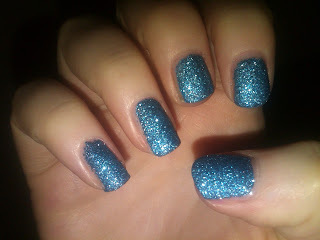 Last month, I posted about Milani's One Coat Glitter Polish that I found at K-Mart. I ended up ordering two more colors because I was so impressed with the quality and price point. Blue Flash is an electric blue that's perfect for the icy winter months (the color of my astrological sign, Aquarius). It reminds me of a glittery ornament. It somewhat lives up to its promise in that you can get away with one coat if you had to but I much prefer 2-3 coats to get a vamped up effect. I like the texture, so I didn't apply a top coat but I imagine it would be extremely sparkly and quite gorgeous with Seche Vite on top. This is the perfect color to add some brightness to the greyer months. It's a bit loud but it's fun.